Based in Cincinnati, Ohio, the Cincinnati Bengals are a professional American football club that competes in the National Football League (NFL), as part of the American Football Conference (AFC) North Division. The team was founded in 1966 by the ex-head coach of the Cleveland Browns, Paul Brown, who also served as the head coach for the Bengals till 1975. The team initially had a tough time but their fortunes turned with the turn of the century. The Bengals had their first winning season and first division title in the mid-2000s under head coach Marvin Lewis. Up until 2016, the Bengals continued to make it to the playoffs, ranking high among NFL teams. There are high hopes for Cincinnati this year. The up and coming Bengals have their sights set on the AFC North and Super Bowl titles. Led by a talented veteran group, Cincinnati will look to beat out rivals the Pittsburgh Steelers and the Baltimore Ravens for hold of the division crown. Grab your Cincinnati Bengals tickets and head over to Paul Brown Stadium and do your part to lead your team to a championship. The Freezer Bowl – The game that sent the Bengals to their first Super Bowl is certainly one of the greatest memories for many Cincy fans. The game took place between the Cincinnati Bengals and the San Diego Chargers at the Riverfront Stadium in Cincinnati, Ohio on January 10, 1982. The Bengals had managed to finish 12-4 in the regular season and were the number one seed in the AFC. The Chargers were the third seeded team and had the most explosive offense in the league. Ken Anderson from the Bengals managed to sway the game in favor of the Bengals going 14 of 22 for 161 yards with two touchdowns. Even though the San Diego Chargers tried to fight back, it became evident that the cold was getting to them. The Bengals ended up winning the game, 27-7. The game was played in the coldest temperature in the history of NFL in terms of wind chill. The air temperature was -9 °F, but the wind chill was -37 F.
The Ickey Shuffle to the Super Bowl - On January 8, 1988, running back Ickey Woods got the highlight of his career, thanks to his performance in the AFC Championship game and the Ickey Shuffle – the dance that took over Cincinnati. The player broke for 100 yards, rushing for the sixth time in nine games. Following his two touchdowns was this famous dance that later became known as the Ickey Shuffle. The dance was in danger of being prohibited by the NFL rules that classified it as Excessive Celebration but after investigation, it did not get banned. Bengals – Steelers Rivalry - The Cincinnati Bengals have faced off against the Pittsburgh Steelers twice every year since becoming division rivals in 1970. The two teams currently compete in the AFC North. In a total of 93 meetings, the Steelers have managed to win 58 games and lose 35. Many Bengal fans consider the Steelers to be their greatest rivals, even more than the Browns. Even though the Steelers have had the upper hand for the most part in this rivalry, recent years saw Bengal’s resurgence among NFL teams. Even during their worst periods, in the 1990s and 2000s, the Bengals still managed to get the best of the Steelers at times. One of the most notable examples of this was when the Bengals defeated the Steelers in the season series and finished with an overall record of 3-13. The loss knocked the Steelers out of the playoff contention, intensifying bad blood between the two rivals. The Bengals - Browns Rivalry – “The Battle of Ohio” - This famous rivalry is between the Cincinnati Bengals and the Cleveland Browns of the NFL. The rivalry has managed to produce two of the eight highest scoring games in the history of the NFL. The Bengals are ahead in this rivalry with a 50-37 record. Both teams were founded by the same head coach, Paul Brown and even the team colors are somewhat similar. The first time the two teams faced off against each other was in 1970 and have played twice a year ever since. The two teams have never met in the playoffs up till now. Over the years, the Bengals have had many talented players on their team. Charlie Joiner is one of those players. He is one of the only two Bengal players who have made it to the Hall of Fame. During his four years with the team, he recorded 82 receptions, six touchdowns and 1,463 yards. A more recent great is A.J. Green. He has been the best receiver in the AFC since his debut in 2011. During his time with the Bengals, he has had 277 receptions, 31 touchdowns and 4,147 yards. Andy Dalton is another great player from the Bengals’ side. His 32-19-1 record is the best winning percentage by any Bengals quarterback by a large margin. The Cincinnati Bengals play their home games at the Paul Brown Stadium which first opened its doors on August 19, 2000. This 66,000 seat venue is located in the heart of Cincinnati, Ohio. Club patrons enjoy extra-wide, padded seats at the prime football viewing level with in-seat food and beverage service, and access to the Club Level Lounges featuring fine dining as well as prime views of the downtown skyline or riverfront. Paul Brown Stadium is the only football stadium to make a list of "America's favorite 150 buildings and structures," according to a Harris Interactive survey. The Cincinnati Bengals – All Set for 2019! The Cincinnati Bengals are now all prepared to enter the 2018 season with a bang. The first regular season game will take place between the Bengals and the Indianapolis Colts at the Lucas Oil Stadium on September 9, 2018. Face offs with rivals Pittsburgh Steelers Cleveland Browns are also scheduled for later in the season. You certainly do not want to miss these games. Grab your Cincinnati Bengals season tickets right now. Our process for purchasing cheap Cincinnati Bengals tickets is simple and fast. There are so many online ticketing sites, that it can be hard for customers to find the right place to buy Cincinnati Bengals tickets at the cheapest price. At ScoreBig we think of our customers first and foremost. We offer daily deals for Cincinnati Bengals events, so our customers can get the best seats for the best prices. ScoreBig will always go above and beyond to offer the cheapest Cincinnati Bengals tickets on the market. The Cincinnati Bengals schedule above, displays all available events for 2019 and 2020. Once you find the event that you would like to go to, click the red “Get Tickets” button. It is located on the right-hand side of the event listing, it will take you to an Cincinnati Bengals event ticket page. ScoreBig's event ticket page will display all available Cincinnati Bengals tickets for that event. On the event ticket page to help with your search for the right Cincinnati Bengals tickets, use the filters at the top to select quantity, price range, and more. There is also an interactive seating chart so you can pick where you want to sit. When you are ready to buy a ticket, click on the listing, and you will be directed to ScoreBig's checkout page. Upon completion of the information fields, your order will be processed and your Cincinnati Bengals tickets will be delivered via email, mail, or to your mobile device. What makes ScoreBig’s site stand out from the rest? We are constantly analyzing our competitors to improve our site, service, and prices. ScoreBig.com employees strive to offer the best process and experience to buy cheap Cincinnati Bengals tickets. Our goal is to get you the best seats to Cincinnati Bengals events. We offer daily discounts on our site and for special promotions check out our newsletter. If there are no Cincinnati Bengals events currently available, you can use our search feature at the top of the page to see a list of all popular events going on near you. No matter your price point, we have all the best deals and discounts on Cincinnati Bengals tickets. For more information on prices of Cincinnati Bengals tickets and the schedule for Cincinnati Bengals, check out our listings above. The last thing you want to find out is when the Cincinnati Bengals event you wanted to go to is sold-out. Don’t worry in many cases ScoreBig has affordable tickets to sold out events. We sell tickets from GA all the way to premium seating and parking. Skip the scalpers in the parking lot and get your tickets online from top Cincinnati Bengals ticket brokers. We get you in all events, buy your Cincinnati Bengals tickets here from a brand that many trust and rely on for all their ticketing needs. ScoreBig offers a 100% money-back guarantee. If you have been in search of cheap tickets for Cincinnati Bengals, ScoreBig by far is the best option. That’s why ScoreBig has more loyal customers than any other ticketing site. 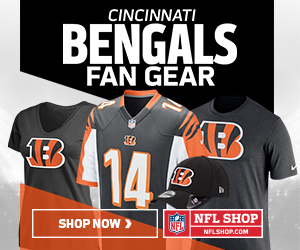 Shop at ScoreBig for safe and secure Cincinnati Bengals event tickets.